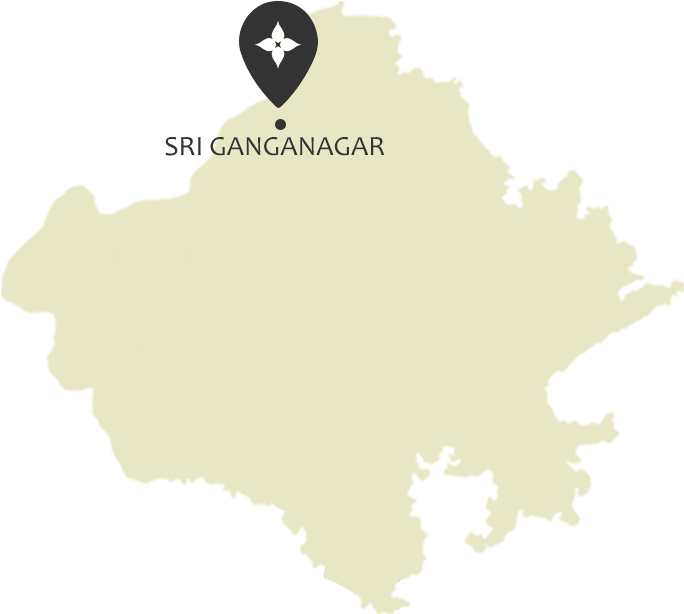 The northern-most city of Rajasthan, Sri Ganganagar is located near the border of the state of Punjab and also the international border of the nation of Pakistan. It is often referred to as “the food basket of Rajasthan” due to its fertile plains similar to those one would find in Punjab. The area was once barren and dry but was converted to a green town thanks to Maharaja Ganga Singh who constructed the Gang Canal to carry excess water from Punjab and Himachal Pradesh to the town. Today, Sri Ganganagar is famed for its produce of wheat, mustard, cotton, bajra, sugarcane and grams. Kinnow, a hybrid citrus fruit is a popular horticultural product that is grown here. Majority of the industries in the area are based on agriculture and it provides a livelihood to a majority of the residents of Sri Ganganagar. In ancient times, two mighty rivers i.e. the Saraswati and the Drishadvati flowed through the area making it home to tribes similar to those belonging to Mohenjo-Daro and Harappa. However, in due course the rivers started to dry up causing a natural calamity that wiped out the tribes and caused Sri Ganganagar to turn into a barren wasteland. During the 15th century, Rao Bika established Bikaner and the territory of Sri Ganganagar was part of the princely State of Bikaner. Finally in 1927, the overhaul of Sri Ganganagar was complete thanks to the Gang Canal constructed by Maharaja Ganga Singh as the city was restored to its former glory. Come explore the wonders and sites that Sri Ganganagar has to offer you. There’s always something to see in Rajasthan. Located on the Anoopgarh-Ramsinghpur road, Bror village is famed for the remnants of the Indus Valley Civilisation being unearthed here. Several artefacts, skeletal remains and buildings have been found in the vicinity of the village and they point to a period of time when the area was thriving with life. The mazar or tomb of Laila-Majnu is situated at Binjaur village around 11kms away from Anupgarh city. Legend has it that the tomb belongs to fabled lovers Laila and Majnu. The story goes that Laila and Majnu belonged to the Sindh and settled here after escaping the clutches of Laila's parents and her brother who were against their courtship. Eventually when Laila and Majnu died, they are believed to have been buried here together. The tomb has today become a symbol of eternal love and people come here from far and wide to seek the blessings of the pair. A fair is held here every year to commemorate the love of Laila and Majnu and it is attended primarily by newlyweds and couples. Located in the town of Anupgarh close to the border of Pakistan, the Anupgarh fort is currently in ruins. However, in its heyday the fort was an imposing structure that helped keep the Bhati Rajputs at bay. The fort was built in the year 1689 by a Mughal governor who wished to keep Anupgarh under Mughal tutelage. The Hindumalkot border situated in the town of Sri Ganganagar separates India and Pakistan. Named in honour of Hindumal, the Diwan of Bikaner, the border is one of the foremost tourist attractions of the city. The border is located at a distance of 25 kms from Sri Ganganagar and is open to the public between 10.00 am and 5.30 am every day. This historical Gurudwara was built to commemorate an important event when Massa Ranghar, guilty of sacrilege at Amritsar’s Golden Temple was brought to justice by Sukha Singh and Mehtab Singh back in 1740. Located by the Dabla village in Ganganagar, this place of worship also houses historical paintings and monuments. Padampur, a city in Ganganagar was named after Rajkumar Padam Singh of the Bikaner State royal family. It functions as an agricultural hub following the construction of the Ganges Canal. The main crops grown here are wheat bajra, sugar cane, grams, and in the recent years, Padampur has gained recognition for the kinnow (a hybrid of an orange). Be a part of the festivities and traditions that Sri Ganganagar has to offer. It’s always a celebration in Rajasthan. Engage in the many activities, tours and adventures that await you in Sri Ganganagar. There’s always something to do in Rajasthan. The Sri Guru Ram Dass Jee International airport in Amritsar is closest to Sri Ganganagar at 271 kms. One can also get to the city via flights to Delhi, Chandigarh and Jaipur. National Highway no. 15 runs through Sri Ganganagar and one can opt for buses from most major North Indian cities to get here. The Sri Ganganagar – Hanumangarh line has been converted to broad gauge making it easily accessible from most major cities including Delhi, Bathinda, Rewari, Haridwar and Nanded among others.